Whisperdale Barn in Silpho, near Harwood Dale, Yorkshire sleeps 7 people. Whisperdale Barn near Harwood Dale is perfect for those who love the country life and the great outdoors. This detached barn conversion is situated in the North York Moors National Park in a secluded valley and surrounded by forest and beautiful countryside. Whisperdale Barn is situated on the owner’s smallholding and is accessed via a steep forest track down into the valley. The drive through the forest to the farm and Whisperdale Barn is approximately 1 mile of forest, but once you reach the valley the scenery is stunning and is a well-kept secret from the outside world. The barn has a great large utility room where you can dry the dogs off after a long walk on the forest trails or it makes for great storage for bikes. This is also a perfect space for bringing the children back from playing in the forest, kicking off their wellies and cleaning them up before enjoying the lovely warmth from the large multi-fuel burner. This area of the county has some of the most beautiful scenery and an abundance of wildlife. From the barn you may see the deer in the distance, foxes, owls and many pheasants that will wander around the smallholding. You really are at one with nature here so a great place to get away from the hustle and bustle of everyday life. 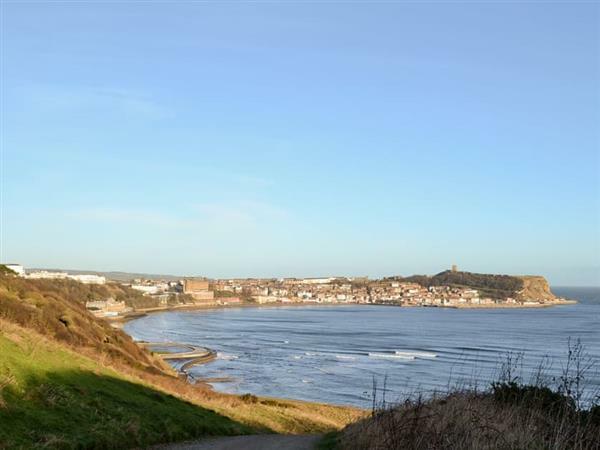 Although the barn is in the forest, you are only 5 miles from the seaside town of Scarborough, which is a great family resort with two very large sandy beaches, perfect for the children. Scarborough is also home to the Alpamare Waterpark, Sealife Centre and the wonderful Peasholm Park, where you can hire boats and pedalos on the lake. There are lots of restaurants, shops and bars, as well as a fantastic open air theatre, the largest in Europe, that hosts many international acts in the summer. Dalby Forest is just a short drive or bike ride from the cottage, and is famous for its world cup mountain bike trails from beginners to the extreme courses. There are over 8,000 acres of forest, with many woodland trails to wander along with the dogs or the children, or both! You will find the beach 6 miles from Whisperdale Barn near Harwood Dale. With the shop and pub 4 miles, and the restaurant is 3 miles from Whisperdale Barn. Living room: With multi-fuel burner and 32 Smart TV. Dining room: With gas fire and patio doors leading to garden. Kitchen: Farmhouse style with gas range and microwave. Bedroom 1: With double bed, single bed, beams and en-suite with shower cubicle and toilet. Central heating from multi-fuel burner, gas, electricity by generator, bed linen, towels and Wi-Fi included. Initial fuel for multi-fuel burner included. Travel cot and highchair available on request. Welcome pack. Small enclosed lawned garden with sitting-out area, garden furniture and barbeque. 2 dogs welcome, to be kept on a lead at all times (sheep country). Bike store. Private parking for 3 cars. No smoking. Please note: The property has a natural water supply from a spring. There is a river in the owner’s garden, 200 yards away. Holidays at Whisperdale Barn run from Friday to Friday. Pets allowed at Whisperdale Barn. For a better idea of where Whisperdale Barn is, you can see Whisperdale Barn on the map below. Whisperdale Barn is in North Yorkshire; should you be on the lookout for a special offer, you can find all the special offers in North Yorkshire. It's always worth checking to see what is on offer at the moment. Do you want to holiday near Whisperdale Barn (UK2611), you can see other cottages within 25 miles of Whisperdale Barn; have a look to find your perfect holiday location.